I love to play banjo, and I’m perfectly happy doing that, but if I know I have to sing I get scared to death! Quoted by Robert Kyle in “Music is One Side of Ben Eldridge: 5-String Banjo Picker,” Frets, May 1979. Ben Eldridge’s first memory of music is of hearing his cousin Mike playing “Red River Valley” on the harmonica. Growing up in Richmond, Virginia, Ben had ready exposure to theOld Dominion Barn Dance, a weekly live broadcast on radio station WRVA. Starting at age nine or ten, he would attend once a month and see performers such as Looney Luke and Roly Poly Reed, Crazy Joe Maphis, Grandpa Jones, Benny Kissinger and Curly Collins, Sunshine Sue, and Mother Maybelle and the Carter Sisters (who lived on the Eldridges’ street). Later, in the early 1950s, bluegrass groups such as Mac Wiseman, Flatt and Scruggs, and the Stanley Brothers were regulars on the program. Following graduation from high school, Ben attended the University of Virginia in Charlottesville, where he studied Mathematics. The campus was home to a number of picking parties over the next four years. 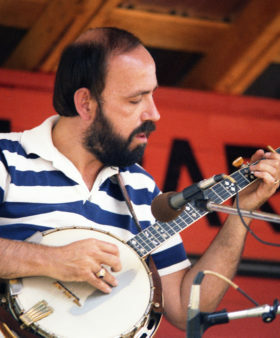 Among the regulars was another banjo picker by the name of Paul Craft, who later played with Jimmy Martin and gained fame as a Nashville songwriter. In 1961 Ben moved to the Washington, D.C., area where he took a job with Johns Hopkins University in their Applied Physics Laboratory. Several years later, he met two other D.C. area pickers, Mike and Dave Auldridge. By 1967 Ben was hosting weekly jam sessions in the basement of his Maryland home. Regular participants included John Starling, the Auldridge brothers, and local DJ Gary Henderson on bass. In September of 1971 Ben, along with bandmate Mike Auldridge, left Cliff Waldron, citing a conflict between too much music and the responsibilities of their day jobs. The parting was amicable and, less than a month later, Ben found himself sitting in with a pick-up band that held down a spot for Cliff when he had to be away for another engagement. 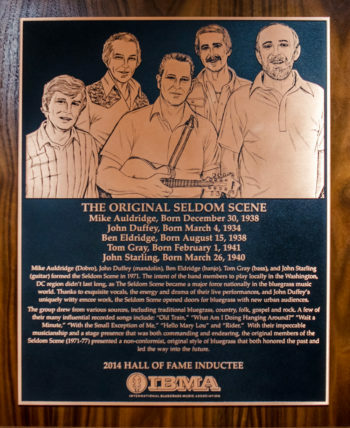 That ensemble soon morphed into the Seldom Scene, with original members John Duffey, John Starling, Mike Auldridge, Ben Eldridge, Tom Gray, and Dave Auldridge. For a number of years, the Scene held down a weekly spot at a Bethesda, Maryland, club called The Red Fox Inn. Later, they alternated between the Red Fox and The Birchmere, a club across the Potomac River in Alexandria, Virginia. When original member John Starling left the group after seven years, the band dropped the Red Fox gig and worked exclusively at The Birchmere. Their weekly appearances helped to establish that venue as one of the premier music nightspots in the Washington area. With over forty years of playing with the Seldom Scene, Ben remains the only original member of the group. To borrow from the frequent play on words that appear in many of their album and CD titles, he has “Scene it all.” From the glory days of the group’s original configuration, when they were one of the cutting edge progressive bands in bluegrass, through a revolving host of lead singers and bass players, the death of the legendary John Duffey, to the group’s long-standing current configuration of guitarist Dudley Connell, mandolin player Lou Reid, bass player Ronnie Simpkins, Dobro player Fred Travers, and, of course, Ben Eldridge on banjo. I think the reason we’ve been successful is that we haven’t really been trying to prove anything to anybody. When we started off, nobody needed to play music to make money. It was something we were all doing for fun, and I think we’ve pretty much maintained that attitude. Quoted by Robert Kyle in “DC’s Best Banjo Picker,” Blueprint Washington’s Bluegrass Newspaper, July 1979. I love the old Flatt and Scruggs stuff and Jimmy Martin and the Stanleys and Osborne Brothers and Don Reno and Red Smiley — that’s what I cut my teeth on. I can still listen to some of those old records that Flatt and Scruggs made back in the early fifties/late forties and get that same feeling that I had when I was a teenager. Quoted by Penny Parsons in “Ben Eldridge – Getting that Magic Feeling,”Bluegrass Unlimited, February 1985. I don’t know how much longer I can do this. It hurts when I play. It’s frustrating because I can’t do a lot of things I used to do. Quoted by David Morris in “Catching Up With Ben Eldridge,”BluegrassToday.com, posted August 22, 2012, accessed July 27, 2014.